Situated close to Chessington, the Holiday Inn M4 J4 has fantastic transport links, great facilities and lots of family-friendly extras. For kids, the hotel offers activity packs, free milk and cookies and a free drink upon arrival. There's even board games available from reception to keep the whole family entertained. For the adults, the hotel is home to a gym for use during your stay, so why not let off some steam with a quick workout before re-fueling in the hotel's informal Rotisserie restaurant. You'll get to save some extra cash at dinner too as the Holiday Inn M4 J4 offers a kids eat free promotion for children under the age of 12. The earliest check in is 2pm, and the latest check out is 12pm. Guests may leave their luggage with reception whilst visiting the Park. There is no swimming pool at the Holiday Inn M4 J4. There is free parking available to all guests at the Holiday Inn M4 J4. There is a gym for the adults to use at The Holiday Inn M4 J4. What extras does the hotel offer? Holiday Inn M4 J4 offers a kids eat free promotion for under 12s and offers Freeview TV in bedrooms. Holiday Inn M4 J4 offers free Wifi. 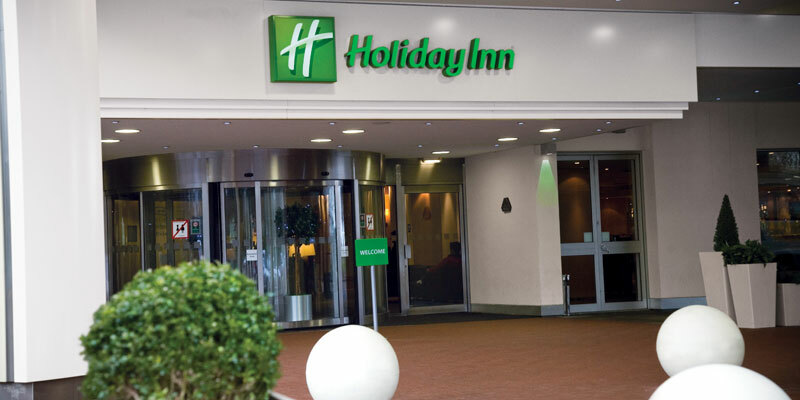 The Holiday Inn M4 J4 is completely accessible and offers 7 accessible rooms. A Full English and Continental buffet style breakfast is included as part of your package. 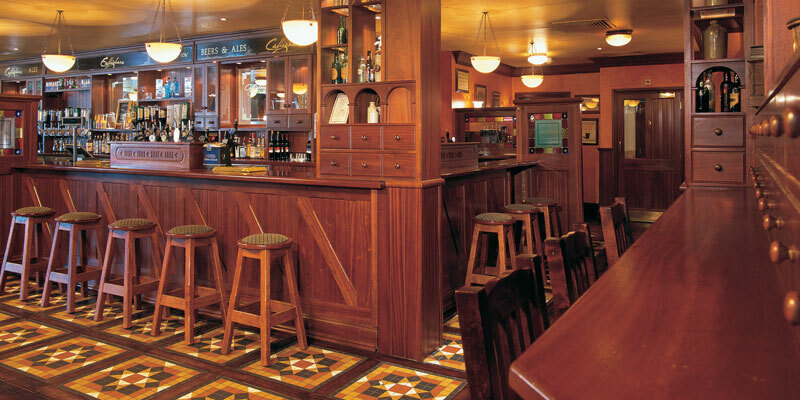 The Rotisserie restaurant serves a wide selection of meals in a relaxing and casual environment. Are there kids dining options? Holiday Inn M4 J4 has a children's menu with healthy options available. 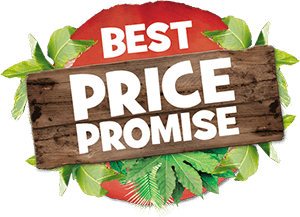 The hotel also has a kids eat free offer for children under 12 dining with a full paying adult. Please note: 1 free child per 1 paying adult. 24 hour room service is available with a £3 tray charge. Are there any dining offers/promotions? Triple rooms will consist of one double bed and one sofa bed. 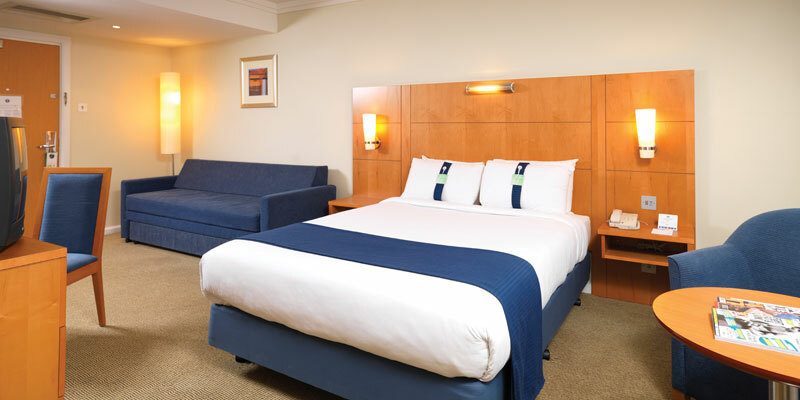 Quad rooms consist of one double bed and one double sofa bed. From the M25: Leave at Junction 15 and take the M4 towards London. Once you see the hotel on your right, leave the motorway at Junction 4. Turn left sign posted 'All Other Routes' and left again into Holloway Lane (A3044). After going under the motorway, the Holiday Inn London Heathrow M4, Jct 4 is on your left at the mini roundabout. Turn left into the hotel entrance. From London: Leave the M4 at Junction 4 and take the third exit (A408). Move to the very left hand side and branch left at the next filter at the large junction signposted 'All Other Routes'. Continue on this road under the motorway, the Holiday Inn London Heathrow M4, Jct 4 is on your left at the mini roundabout. Turn left into the hotel entrance. From Heathrow: From Terminals 1, 2 and 3 follow the airport exit signs to the M4/M25 motorway. Keep in the middle lane when approaching the M4 motorway. Proceed under the motorway, the Holiday Inn London Heathrow M4, Jct 4 is on your left at the mini roundabout. Turn left into the hotel entrance. We recommend you use these directions with an up-to-date road atlas. For satellite navigation systems, please programme the following postcode UB7 0HP. The Holiday Inn M4 J4 is located 15 miles away from Chessington and is 1.5 miles away from London Heathrow Airport. Terms and conditions apply. Extra day free and theme park tickets are based on park opening times. Exclusions may apply.